Last couple of days I’ve been at IWMW12 hosted this year at University of Edinburgh. I’ve already posted Data Visualisation Plenary/Workshop Resources which has my slides from the plenary. I was teaming up with Tony Hirst (OU) and have included his slides to the page. Because of living ‘almost locally’ and other family commitments I missed out on most of the social events, instead I got drunk on data working into the early hours to find what stories I could uncover from the #IWMW12 stream. In this post I’ll show you what I’ve come up with and some of the highlights in trying to turn raw data into something interesting/meaningful (or pointless if you prefer). Interestingly a lot of what I cover here uses the same techniques used in my recent The story data tells us about #CitizenRelay guest post, so I’ve got an emerging templated workflow emerging which I can deploy at events which makes me wonder if I should be getting organisers pay my travel/accommodation as an event data amplifier? 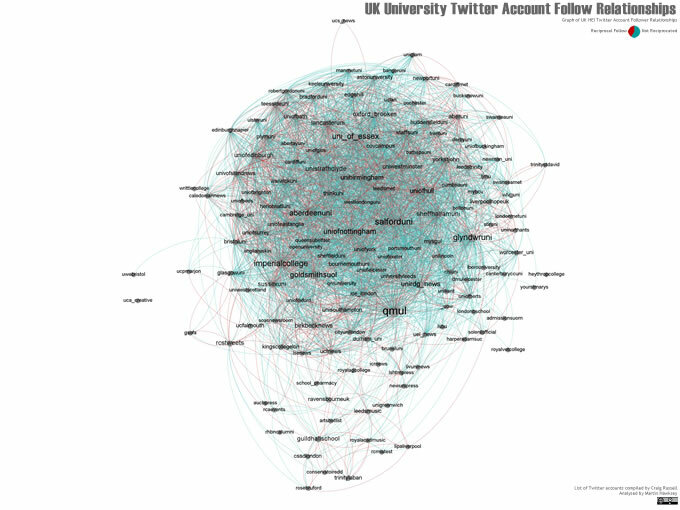 On day one Brian Kelly mentioned some work by Craig Russell to collate a table of UK University Social Media accounts which featured in a guest post on Brian’s blog titled Further Evidence of Use of Social Networks in the UK Higher Education Sector. You can get the data Craig has compiled from a Google Spreadsheet. Looking at this two things immediately sprung to mind. First that the document could be made more ‘glanceable’ just using some simple conditional formatting, and second there was a nice list of Twitter accounts to do something with. 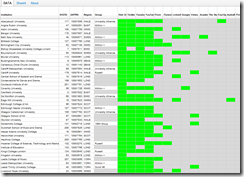 Here’s a link to my modified version Craig’s spreadsheet. It uses the importRange formula to pull the data in so it creates a live link to the source document. 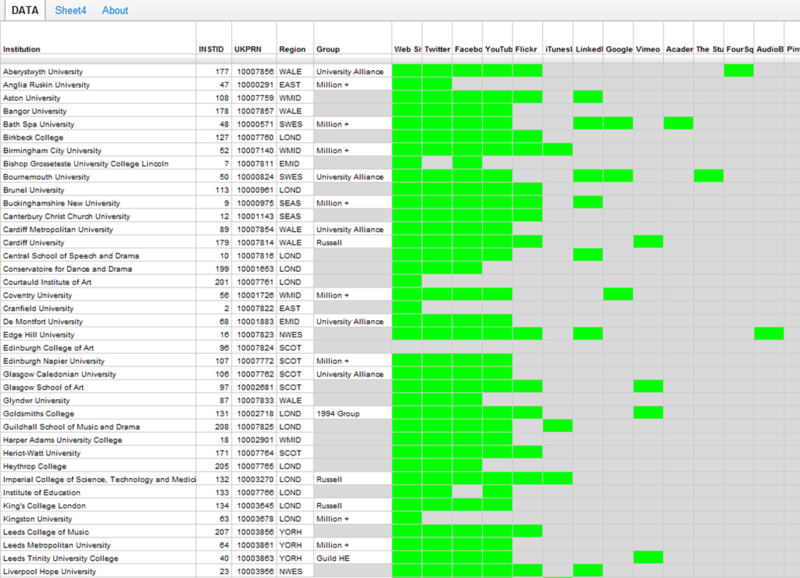 For the conditional formatting I looked for text containing ‘http’ turning the cell text and background green. The HTML view of this is a lot cleaner looking. On the Twitter Accounts sheet extract the account screen names by pulling everything after the last ‘/’ and remove most of the blank rows using a unique formula. Putting this list into the free MS Excel add-in NodeXL and using the Import > From Twitter List Network lets you get data on which of these accounts follow each other. I played around with visualising the network in NodeXL but found it easier in the end to put the data into Gephi getting the image below. These ‘hairballs’ have limited value and you’re best having a play with the interactive version, which is an export of Gephi visualised using the gexf-js tool by Raphaël Velt (De-hairballing is something Clement Levallois (‏@seinecle) and he kindly sent me a post to a new tool he’s creating called Gaze). 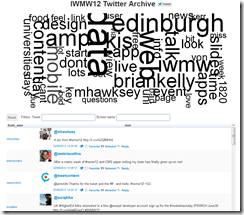 New way number one is a filterable/searchable archive of IWMW12 tweets. Using the Google Visualisation API I can create a custom interface to the Google Spreadsheet of tweets. This solution uses some out-of-the-box functionality including table paging, string filtering and pattern formatting. Using the pattern formatter was the biggest achievement as it allows you to insert Twitter Web Intents functionality (so if you click to reply to a tweet it pulls up Twitter’s reply box. #iwmw12 OK. I’m getting this theme now… Content *is* data. Store it. Catalog it. Share it. Present it visually. And re-use it.